To save an endangered species, the Egyptian Vulture, institutions and organisations from 14 countries spanning the Balkans, Middle East and Africa have joined forces proving that political borders do not exist in these efforts. All of them have united under the project “Urgent Actions to Strengthen the Balkan Population of the Egyptian Vulture and Secure Its Flyway” (LIFE16 NAT/BG/000874), abbreviated to Egyptian Vulture – New LIFE Project, launched in July 2017 with financial support from the EU’s LIFE Programme. 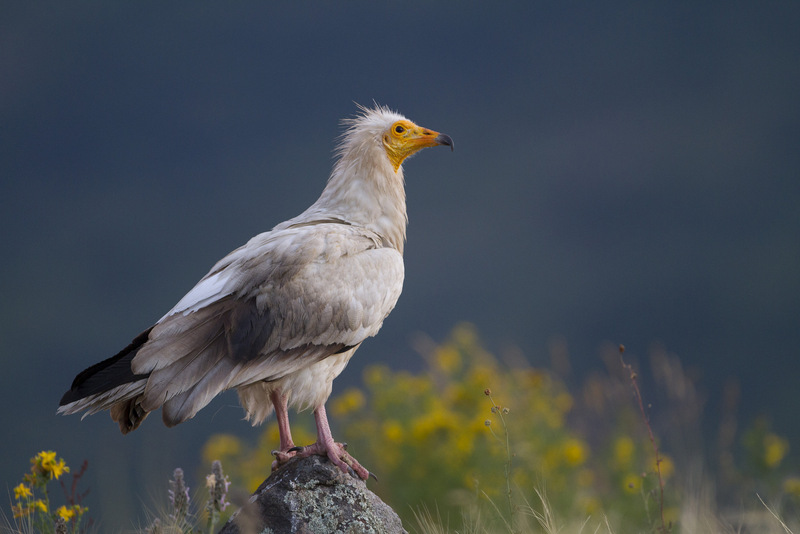 The Egyptian Vulture is a globally threatened species and over the last 30 years its population in the Balkans has declined by more than 80%, with no more than 70 pairs remaining. The reasons for this can be found not only on its breeding grounds on the peninsula, but also along its flyway. Among the four vulture species breeding in western Palearctic, the Egyptian Vulture is the only regular long-distant migrant. Every autumn, individual birds fly over 8,000 km to their wintering grounds in Africa, and return back to the Balkans in the following spring. The aim of the project is to reinforce the easternmost European Egyptian Vulture population by delivering urgent conservation measures to address major known threats at breeding grounds and also along the flyway. The project is building on actions undertaken between 2011 and 2016 through The Return of the Neophron project. The project objectives are in line with the aims of most recent strategic document outlining the conservation tactics to save the species: the Flyway Action Plan for the Conservation of the Balkan and Central Asian Populations of the Egyptian Vulture Neophron percnopterus (EVFAP), as an integrated key component of the Multi-species Action Plan to Conserve African-Eurasian Vultures (Vulture MsAP). The main efforts under the Egyptian Vulture New LIFE project will be targeting two key components: (1) Achieving a steady increase of the population on the breeding grounds in the Balkans; and, (2) Enhancing the context for conservation along the flyway and in the wintering grounds by minimizing loss of migrating birds, particularly mature individuals. The Balkan regional component (Bulgaria, Greece, Albania, FYR of Macedonia) of the project involves creating vulture safe zones (free of poison and with sufficient safe available food) and developing the capacity and infrastructure to deploy a full scale restocking programme in the near future, considered necessary to rapidly halt and reverse current populations declines. The project will actively engage with national institutions to ensure appropriate legal protection is in place and being implemented effectively. In addition, local authorities in rural settlements will be encouraged to establish controlled carcass dumps offering safe food for the vultures. The illegal use of poison baits is still an issue for all Balkan countries; hence, the project aims to replicate successful activities already implemented in Greece to raise awareness among institutions, stakeholders, and individuals affected with the aim of creating a Balkan anti-poison network. To eliminate accidental poisoning, the project will campaign to discourage the overuse of hazardous agriculture chemicals (e.g. by reducing agriculture subsidies to violators) and toxic veterinary drugs (e.g. prohibit veterinary use of Diclofenac and encourage use of alternatives). The Flyway component of the project will undertake urgent activities proposed in the International Flyway Action Plan to tackle known threats. Unfortunately, large parts of range countries in the Middle East (Egypt, Lebanon and Syria) and some African countries (Chad, Ethiopia, Niger, Nigeria and Sudan) are subject to various levels of human military conflict. The project strategy is therefore to secure transfer of experience and to build capacity in those territories which are safe enough to do so and work with the most stable local organisations (governmental or non-governmental). The main goals are to: reduce the loss of individuals due to electrocution at the main roosting sites in Ethiopia; pilot actions to eliminate the use of Strychnine or other poisons used to control rabies (which can affect birds), specifically at key vulture congregation sites in Ethiopia and Chad; develop local capacity to combat the use of birds in in the believe-based traditional healings (Nigeria); and, enhance local capacity to combat illegal killing of birds (Middle East). A large scale awareness-raising and information campaign is built into the project. This will comprise several distinctive clusters of activity specifically designed to meet the needs of key stakeholders and audiences. Within the project, two major information campaigns are planned to raise awareness about the threats for the Egyptian Vulture – from electrocution to poisoning and poaching. A campaign entitled “A Mile for the Egyptian Vulture” will compare the Egyptian Vulture migration journey – a race for survival – with a marathon runner. Both are difficult, challenging and present many obstacles along the way. During the second campaign entitled “Fly with the Vulture” huge murals about the Egyptian Vulture and the main threats it faces during migration will be created at some of the biggest airports along the Egyptian Vulture’s flyway. Communication activities under the project will also involve: capacity building for local institutions through seminars, involving practical fieldwork; communicating the main threats to the vultures based on country specific messages targeted particularly at local audiences who are responsible for generating the main threats (poisoning, shooting, belief-based use, etc. ); and, training offered to local communities to promote the uptake of techniques to establish vulture safe zones, including by adopted vulture-friendly practices (e.g. switch to using non-toxic veterinary drugs, ceasing the use of Strychnine or agriculture chemicals illegally, refraining from shooting birds, strengthening law enforcement, etc.). The period of implementation of the project is 5,5 years (1 July 2017 – 31 December 2022). The Coordinating Beneficiary is the Bulgarian Society for the Protection of Birds / BirdLife Bulgaria (BSPB). Associated Beneficiaries are: Hellenic Ornithological Society / BirdLife Greece (HOS), WWF Greece, the Royal Society for the Protection of Birds / BirdLife UK (RSPB), Doğa Derneği / BirdLife Turkey (DD), regional offices of BirdLife International in Africa and Middle East, A.P. Leventis Ornithological and Research Institute (APLORI), CMS Raptors MoU, Green Balkans.